A warm welcome awaits you in this luxurious 5* guesthouse nestling in the rolling countryside bordering Co-Down and Co-Armagh. Owners Joyce and Steve want their guests to enjoy the tastiest food made with the best local ingredients. 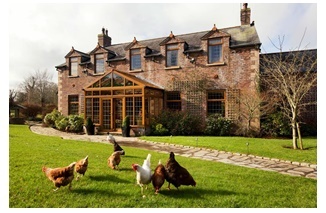 They get their meat from the award-winning Quail’s in Banbridge. The vegetables are grown by local farmers. They use Clandeboye Yoghurt, White’s Porridge, Broighter Gold Rapeseed Oil and not forgetting the freshest of eggs from their own hens in the meadow and herbs from the garden. Feast on home cooked Granola, Irish Breads, Preserves and Bottled Fruit from the breakfast buffet before tucking into an Ulster fry made to order on the Aga. We love the complimentary Cream Tea on arrival (between 3.00 and 4.00pm) .You can tuck into scrumptious, hot, freshly baked scones with lashings of fresh Irish cream and homemade raspberry or strawberry preserves. There are lots of things to do close by, but if you feel like learning to cook your own pancakes or Irish soda bread on Great Aunt Maggie’s Griddle, which is over 100 years old, just book a slot with Joyce and the Aga Stove. Oh, and did we mention the turndown service with home-made truffles? So 5 star!